Six ways to instill the love of the wild in a child. It’s a profound yet simple statement: ﻿Kids belong outside. ﻿﻿My children have enjoyed the natural world on a daily basis since they were small. My wife and I introduced our children to Texas’ wild things because we want our kids to love the outdoors. Something deeper than appreciating flora and fauna connects kids with outside playtime. A litany of scientific studies proves what many Texas parents know instinctively — there is lasting physical and cognitive value in turning off electronic entertainment and venturing outdoors. Growing up in the late 1970s and ’80s, I spent most of my free time in the wild. I grew up in the country, so being outside was a given, since there wasn’t much competition in the house for my time. Depending on the season, I hunted, fished, camped, hiked or explored, year after year. Mussed hair and dirty nails meant that I was playing hard. Though mom would make me bathe, free time was pretty much a repeated pattern: play, get dirty, repeat. It’s a far different world today. The Kaiser Family Foundation reports that children today spend an average of seven and a half hours a day consuming electronic media. Shockingly, less than four minutes a day is spent in unstructured outdoor play. The Nielsen Company says that most preschoolers log in excess of 32 hours of TV per week and have seen more than 5,000 hours of television by the time they reach kindergarten. That’s equivalent to the amount of time it takes to earn a college degree. The resulting lack of activity has many people alarmed. 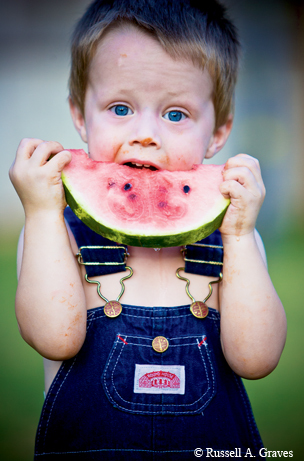 The Centers for Disease Control and Prevention reports that since 1980, obesity in children and adolescents has tripled. As a result, diseases like type 2 diabetes, once primarily found in adults, now show up with alarming frequency in children. The rise in attention deficit disorder, some studies suggest, also may be due to decreased unstructured outdoor playtime. Louv’s words, at least on an anecdotal level, are spot on. I saw it for myself during my 16 years in the Texas public school system, teaching agriculture science with a curriculum based on outdoor education. In that very rural Northwest Texas school district, many of the students had little or no exposure to outdoor activities. So I made it a point to organize an annual wilderness trip to camp, hike and cook in the outdoors. Fifteen years after that first trip, my former students, some in their mid-30s now, still talk fondly about those trips and how much they cherished the experience. Kids need the outdoors on a mental, physical and spiritual level. A growing body of research shows that outdoor play helps kids focus in school and increases creativity, cooperation, self-reliance and self-esteem. The experts in the Texas Partnership for Children in Nature looked at the studies and deemed nature play an important tool for “healthier, happier, smarter” kids. The links to physical and mental health are clear. Want your kids to spend more time outside? Here are six easy ways to instill a love of the outdoors in your children. Humans are genetically disposed to hunt and gather, so learning about the outside world starts at an early age by design. Children’s inherent curiosity is easily tuned in to learning about nature. When my children were small, we’d pick flowers and study their parts. We’d play with ladybugs, and learn which plants and animals stick or sting, and which ones don’t. It’s just that simple. Learning about nature doesn’t have to be complicated. Spending time outdoors as a child yields memories that last a lifetime. 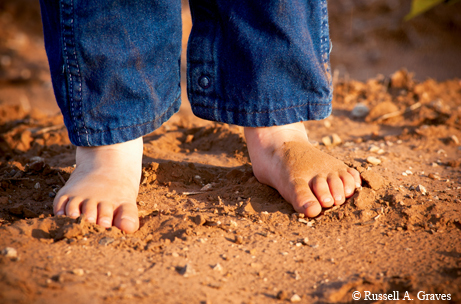 Schools across Texas recognize the importance of including nature in their curriculum. Any school with an agricultural science program has the option of including a wildlife and recreation component. Physical education and science classes often include recreational and ecological components as well. Although the educational framework may be in place, it takes someone who is passionate and willing to introduce kids to the valuable lessons the outdoors teaches. Sepulveda says that they’ve taken kids to state parks like Tyler, Enchanted Rock and Palo Duro. On these trips, kids participate in team building and community cooking exercises and learn proper equipment care. The class is so popular, they’ve had to cap enrollment. There’s a waiting list to get in. ﻿Some people argue that one of the key disconnects of modern society is that many people no longer have a direct connection to where their food and fiber come from. Do your kids know how their supper grows, or where their cotton T-shirt comes from? For the past decade, Novak and other local agricultural leaders have hosted Childress County Ag Day. This event teaches fifth-graders about the importance of agriculture production and good stewardship of food, fiber and natural resources. Vegetable gardening — whether in small, backyard containers or larger spreads — is a great way to introduce kids to the food production process. Watching plants grow from a seed to food you can eat is instructive and opens up opportunities for all kinds of ecological lessons throughout the growing season. Small farmer Barbara Adams likes introducing her grandkids to nature through old-fashioned hard work. “As a grandparent with a farm at her disposal, I make it a priority to see that the kids get to help me with all the chores as soon as they can walk,” she says. “Feeding, egg gathering, climbing the hay — these are things they help me with. While we work, I see an appreciation of nature and animals blossom in them. They live in town but love to visit because they can get outside, get dirty and get their hands on the animals. “I think a little goat slobber is good for them,” she says with a smile. Outdoor writer Brian Strickland, who splits his time between Texas and Colorado, plans family vacations with the outdoors in mind. “We are on the road a lot, and I try to plan our routes based on stuff to do that’s nature-related,” he says. His three children, who range in age from 8 to 13, enjoy fishing, hiking, hunting and exploring with Brian and their mother, Renee. “When we are in Colorado, we hike and camp quite a bit. On our travels to Texas, we’ll make detours into Palo Duro Canyon, explore the Sam Houston National Forest or head down to the Hill Country and float the Comal River.” Strickland acknowledges that it adds a day or two to his trips, but the detours help break up the monotony of all the time they spend driving. Dale Rollins, Texas A&M AgriLife Extension Service wildlife specialist and director of the Rolling Plains Quail Research Ranch, has a passion for teaching young people about conservation and the outdoors. Each year for nearly two decades, he’s gathered financial and human resources to produce Texas Brigades, a series of conservation summer camps held for teenagers in various locations across Texas. 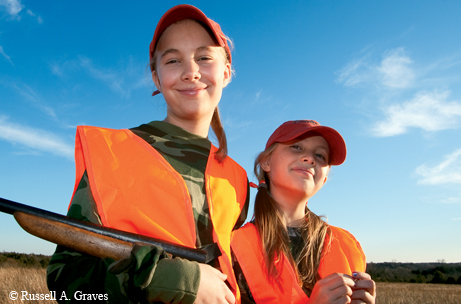 To combat the problem, Texas Brigades seeks to introduce youth to conservation and teach them to become ambassadors for the outdoors. The camps are full immersion — a veritable boot camp on conservation. The result? Consumptive outdoor activities are an excellent way of teaching kids about the outdoors. Chef Jesse Morris of Dallas teaches his daughters lessons about conservation through the food chain. Morris’ strategy is simple. He wants to include his young daughters in every step of the food gathering process so they have an understanding of how humans and animals interact. In Texas, there’s a readily available opportunity to teach these lessons because there are millions of acres of public waters and public hunting land peppered across the state. For a nominal cost, fishing and hunting opportunities abound. Our hope is simple. As we raise our kids to be a part of rural Texas, we hope that the love and longing for the outdoors is planted deep within them. Those memories they are making each time they head outdoors are eternal. One day, they’ll pass on these lessons to their own children.